Pools and Landscaping. Design Build. I have worked with Matteo and his team for 5 years in Toronto, York Region and the GTA. Matt’s knowledge and creativity with pool designs and installation have allowed us at Hollander Landscaping to easily add the final touches to our clients’ landscaping to complement the pool and backyard areas. 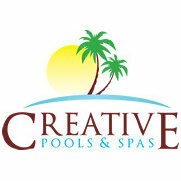 Creative Pool and Spa staff were very professional and extremely effecient with their time! The began our job and stayed right to the very end. They didn't take days off in between until our pool and landscaping was complete. Excellent work...completed satisfied with the end product....I would highly recommend Creative Pools and Spas to anyone looking for a pool and/or landscaping!!! 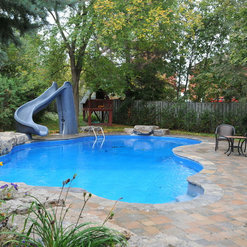 Creative Pools was awarded our backyard pool, deck, cabana and landscaping project. They quickly provided a conceptual design for the backyard, integrated our unique ideas and then provided a competitive price. Matt took the time to meet with us many times at our home and at the landscape supply company to help us with decisions and to ensure we where comfortable with our terrace stone selection and other landscape features. We were extremely pleased with the entire Creative Pool team as they were very professional and the quality of work was outstanding. Creative Pools transformed our backyard into a sleek contemporary functional pool area for lounging, entertaining and having hours of fun in the pool with the family and friends. We highly recommend Creative Pools and wish continued success to Matt and his team. Creative Pools was recommended to us by a friend. We met with Matteo and he provided us with a detailed quote. We were extremely satisfied with the quality of work, the friendliness of his crew, the ability to accommodate with our scheduling. The crew was very knowledgeable and helpful with any questions or concerns we had. Creative Pools made our project a great experience and we would highly recommend them to everyone. Last year we enjoyed our first full summer of our pool. Le me tell you that Matteo and his crew did a fantastic job. We were satisfied with the the quality of the workmanship and the fact that they were always available for touch ups if needed, and any time we had a question that need to be answered. Creative Pools handled all of the pool installation as well as the landscaping through out. Most importantly they stand behind their work.